Pretty villa set on 2 different levels at approx. 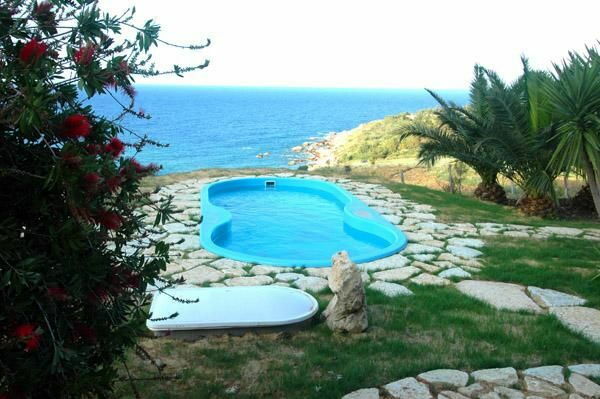 120 meters from the sea, close to the Zingaro Natural Reserve. The house is surrounded by a large veranda and is situated in a panoramic position with view over the coastline. Distances: Scopello, with all kinds of shops at approx. 2 km, Castellammare del Golfo approx. 5 km, Palermo airport approx. 40 km, the beaches are at approx. 100 meters. At guests’ disposal: large furnished garden, swimming pool (available starting from April 2007), outdoor showers, barbecue. Laundry room with washing machine and iron at guests’ disposal. The house has air conditioning, heating and alarm. 120 m2. Ground floor: living room with kitchen corner, double bedroom, bathroom with shower. 1st floor (access through an external staircase): 2 double bedrooms, bathroom with shower. A large furnished veranda surrounds the house.